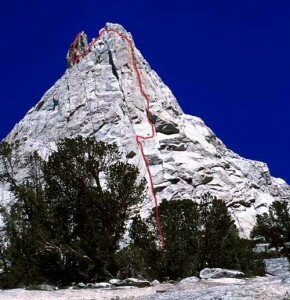 A few hundred feet from the summit of Cathedral Peak stands Eichorn’s Pinnacle—one of the most spectacular features in the Sierra. While Cathedral Peak is an outstanding climb in its own right, combine it with Eichorn’s Pinnacle and you will have ticked two of the most classic summits in Tuolumne. The North Face, the most popular line, is one of the most exhilarating 5.4 climbs you will ever do. The West Pillar climbs five good pitches of sustained 5.8 and 5.9 (or a 5.10b variation) and joins up with the North Face right near the summit. Which SuperTopo guidebooks include a topo for West Pillar? West Pillar as seen from the base.